It is incredible and surprising to realize that a small bird that weighs less than 7 grams can migrate from the UC Hopland Research Center to places like Belize, Guatamala, and Honduras for the winter ... and then return. 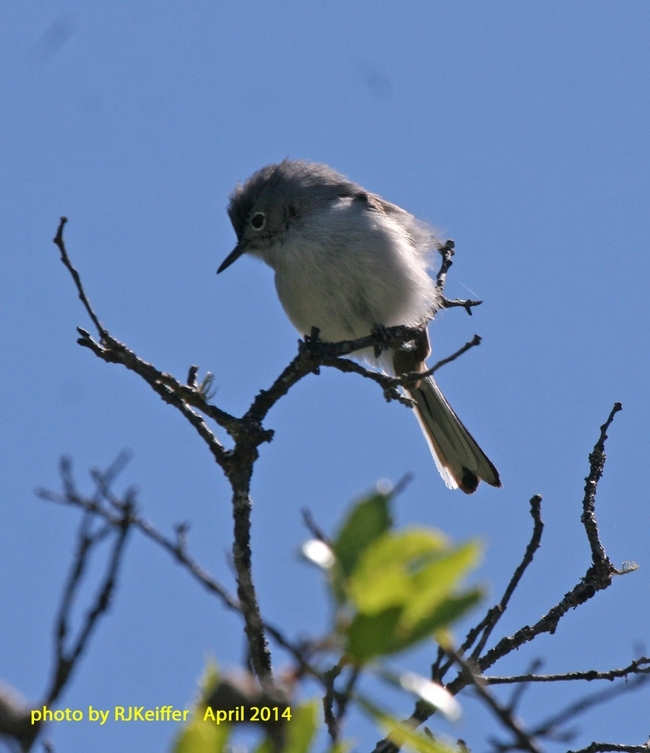 The Blue-gray Gnatcatcher (Polioptila caeruleana) is a very small songbird that returns to the chaparral brushlands of the Center each April. These unique birds have a very squeaky, wheezy call that cannot be missed by human ear once you learn it. A pair will establish a territory of their own and proceed to build a camouflaged cup nest in the fork of a chaparral-type bush or small tree, many times a chamise bush, scrub oak, or live oak. The outside of the nest is covered with bits of lichen and spider web so that it blends in with the adjacent trunk and limbs. About 4 to 5 eggs are laid and incubation only takes 13 days. HREC has many opportunities for the study of neo-tropical migrant bird species. Especially lacking is knowledge of bird use in the chaparral habitats of the North Coast.